On Saturday 19th July 2014 we return to our spiritual home for the fourth Camden Palace Reunion. This will be our biggest line up to date and will include some very special treats. For the first time ever, we will be paying a tribute to the music that spawned a generation of events when we see Huck Finn, Rob Blake, Matt Emulsion and Stuart J come together to give you a special 90 minute authentic classic House set. Danny Byrd, Hospital Records, will be doing an exclusive Drum & Bass Classics set. Grant from Epidemik will be welcoming you all to his Old Skool birthday party in Room 2. And, if that wasn’t enough, Jenna G will also be performing live on the night. THIS WILL BE THE ONLY OLD SKOOL EVENT AT KOKO THIS YEAR SO DON’T MISS OUT. 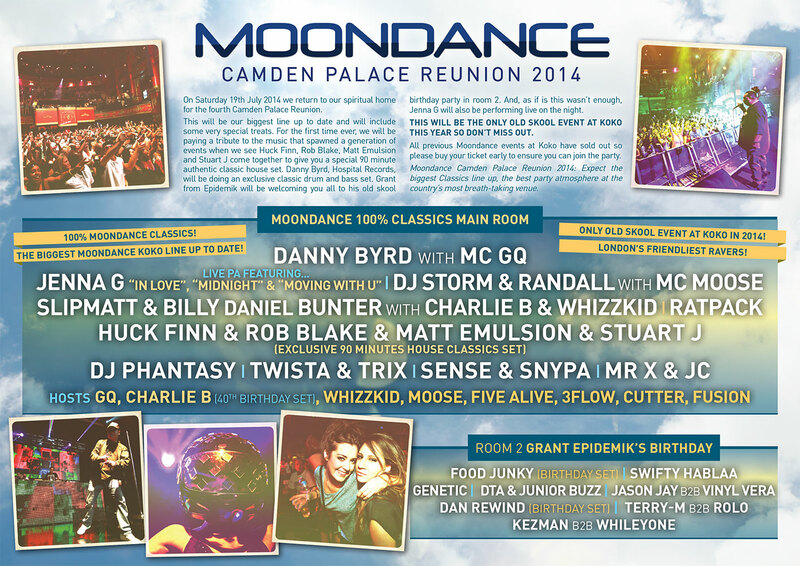 Moondance Camden Palace Reunion 2014: Expect the biggest Classics line up, the best party atmosphere at the country’s most breath-taking venue. THE BIGGEST MOONDANCE KOKO LINE UP TO DATE! ONLY OLD SKOOL EVENT AT KOKO IN 2014!